The user installing's Windows Account must have administrative permissions for the SQL server. If you don't already have it installed, the installer will install .NET 4.5 for you and launch the full screen installer, displaying the license agreement. New Install: Install a new copy of the AuthAnvil Password Server. New Install and Restore Data: Install a new copy of the AuthAnvil Password Server and restore from an existing database backup (.psb) file. Cluster: Install an additional AuthAnvil Password Server node that points to an existing database. AuthAnvil Password Server requires an active subscription account. Collect your Administrative Contact and Subscription Key from the Customer Portal, which the installer will validate before allowing you to continue. If you don't have an account, please contact your account manager or email sales@scorpionsoft.com. You can retrieve your subscription key from https://customer.scorpionsoft.com. If you chose "Install to an existing SQL Server", the installer will next ask you for the location of the SQL Server instance. Enter this in the form of SQLSERVERNAME\INSTANCENAME or SQLSERVERNAME if the server does not use a named instance. Note: This SQL server needs to support Mixed Mode Authentication, and the Windows account that you are currently logged in as will need to have administrative permissions on the SQL server instance that you select. If you chose "New Install and Restore Data", the installer will ask you for the location of the AuthAnvil Password Server Database Backup (psb) file to restore from. Next, if you chose "New Install", the install will ask for your Organization Name and get you to set up your first user. The organization name is used to identify your first site on this server, and your first user will be the first administrator on this installation of the AuthAnvil Password Server. If "New Install" is chosen, the installer will ask you for your email server settings. The email server defines where the AuthAnvil Password Server will send email messages for alerts and password requests. This should be a resolvable name or IP address to a working SMTP server that will allow the AuthAnvil Password Server to relay messages through it. The From Address field defines who the email will be sent from, such as 'passwordserver@yourdomain.com'. Finally, the installer will ask you to pick which website in IIS you want the AuthAnvil Password Server to be installed to. If you are unsure, select "Default Web Site" or the first item in the list. Scorpion Software recommends that you use a website that has an SSL certificate assigned to it. A certificate can be assigned after the installation. (See Configuring secure communications with SSL later in this document for more information). Note for SBS 2008 installs: You should install AuthAnvil into the SBS Web Applications site on an SBS 2008 server. SBS 2011 uses "Default Web Site". After selecting the website AuthAnvil will detect the base FQDN of the certificate installed. 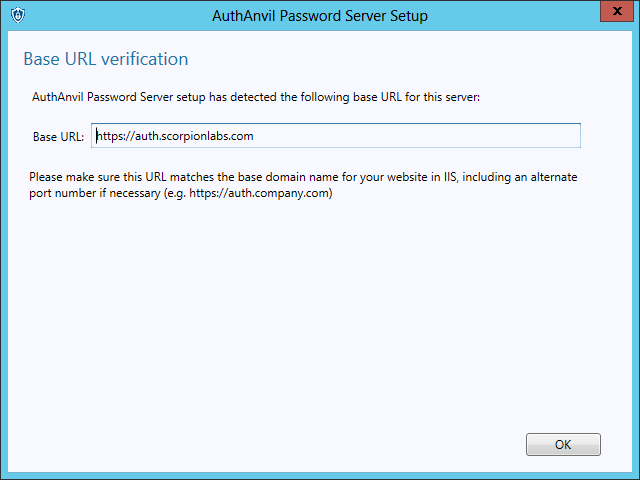 If you have a wildcard certificate or a multi-name SAN certificate you can customize the configuration that the AuthAnvil Password Server will use for it's service URLs. Make sure the URL resolves locally on this server, otherwise the software may be unable to communicate with its web services. After confirming your configuration, setup will complete a few final tasks and display a "Setup Complete" message. Click Finish to complete the install and launch the AuthAnvil Password Server.